Okay, this isn't HIP. In fact, for some reason I find myself thinking more of Beethoven's Missa Solemnis than of early Baroque. The sound is monaural and a bit congested. The singing is excellent. Of course the primary audience for this disc is not the academics, but people whom like Stokowski's way with music. Will they get what they want? With a few qualifications I think I can say that they will. 1952 was another of Leopold Stokowski's peripatetic years. He was no longer a contender for the post at the New York Philharmonic and had yet to travel to Houston. He made recordings with "His" Symphony Orchestra for RCA and other ad hoc bands. He was a guest conductor many places, but home was not a place he lived. To an extent, his reputation was tarnished. Toscanini was the be-all and end-all of conducting and his attitude towards Stokowski (a buffoon) was shared by many, but not all. Stokowski as a choral conductor may seem odd, but it shouldn't. One of the first documented accounts of his conducting was as a choir leader in England. In 1900 (at only 18) he formed the choir of St. Mary's Church on Charing Cross where he trained the choirboys and played the organ. I also have a video of him conducting Christmas music with a choir and Marian Anderson that was made around the time of the Second World War. Baroque music was certainly no stranger to Stokowski. 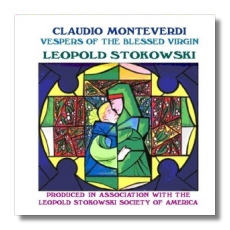 Monteverdi's Vespero was composed in 1610, and you can hear the early foreshadows of the baroque here. While this may lead the listener to expect a recording that is Monty/Stokowski (a la Bach/Stokowski), in fact it is remarkably stylistic, if not HIP, and not at all like Stokowski's Bach transcriptions. I have no comparisons to make, but I find the music to be very moving and beautiful. The orchestral solos, especially the flute, are wonderful. I can't help but wonder if they were added or if the way they are played was molded by Stokowski. For what it is worth, I wrote the insert notes. For that I got two copies of the disc. So now you know to what extent I was involved in the production.